First do no harm. These words are the battle cry for many of us, but took on an sense of urgency ever since the Institute of Medicine (IOM) published “To Err Is Human” in 1999. This famous report launched the modern patient safety movement and shined a spotlight on the shocking number of medical errors occurring every day in our hospitals. The IOM estimated that between 44,000 and 98,000 fatal medical errors occurred annually in the US. Unfortunately, the follow-up report from the IOM in 2001, Crossing the Quality Chasm, didn’t show much improvement. In the years since, herculean efforts have been made in the area of patient safety to improve the reliability and quality of medical care. In 2006, the Department of Defense and the Agency for Healthcare Research and Quality (AHRQ) created the TeamSTEPPS program to improve communication and teamwork among healthcare providers with the goal of improving patient safety. In the Army Medical Department, all employees receive initial TeamSTEPPS training and then annual refresher training. In my hospital, it is most commonly implemented to full effect on the labor and delivery deck. We also include it in our medical simulation training and all residents are trained to use the TeamSTEPPS “I PASS THE BATON” mnemonic for handoffs. 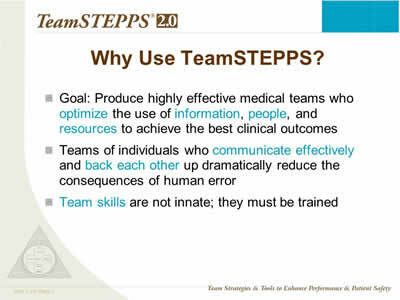 Unlike most “mandatory training”, TeamSTEPPS has evidence that it works. The TeamSTEPPS website lists all of the published research on the program. Login to iMedicalApps in order to view the following video review of the TeamSTEPPS 2.0 app. Registration for iMedicalApps is free. TeamSTEPPS is owned by the AHRQ and there is evidence that TeamSTEPPS training improves communication between providers and patient outcomes. The app could be improved by linking to that information rather than just describing the principles and key tools used in the TeamSTEPPS program. Any healthcare provider who has completed the AHRQ TeamSTEPPS training including students, NP’s, PA’s, OB/GYN, Emergency Medicine, Family Medicine, Internal Medicine, and Critical Care providers. Contains all of the key TeamSTEPPS tools for improving communication and safety. Interface could be easier to navigate. Only contains video demonstrating one TeamSTEPPS tool. Could benefit from better directions on how to use the materials in the app. The TeamSTEPPS 2.0 pocket guide is a wonderful companion app to the AHRQ TeamSTEPPS program. Instead of carrying around a paper pocket guide in your white coat, you can now quickly access the helpful tools taught in the program. This will allow for improved communication between providers throughout the hospital and improve patient safety. Anyone who has taken TeamSTEPPS needs this app. User InterfaceEasy to use interface with helpful table of contents, but tools section should be more intuitive and take you straight to the tool you want to review. Multimedia UsageApp includes one video demonstrating one of the TeamSTEPPS tools and links to the TeamSTEPPS website. Real World ApplicabilityThe TeamSTEPPS 2.0 pocket guide app is the perfect companion app for everyone who has completed the AHRQ TeamSTEPPS training. The app contains summaries of all of the helpful tools and strategies to improve patient care and safety taught in the course. The app would be more applicable if the tools were easier to access and more video examples describing how to use them were included in the app for review.